If you are looking for a periodontist in the northern Shenandoah Valley or have been referred by your dentist or physician I welcome you to the practice. I believe all patients deserve the information needed to make wise, informed choices about their oral health. As you navigate through the site you will find an introduction to the practice, a summary of the procedures offered and links to websites with a wealth of comprehensive information on periodontics and implant dentistry. Thank you again for visiting the website. I look forward to providing you with the best possible care to ensure your teeth and gums are healthy for a lifetime. Please contact the office at (540) 868-2740 if you have any question or would like to schedule an appointment. Dr. Zemanovich listened to my concerns and completed a thorough examination to evaluate my overall dental health. He made every effort to help me understand my dental condition and discussed how further problems can be prevented. 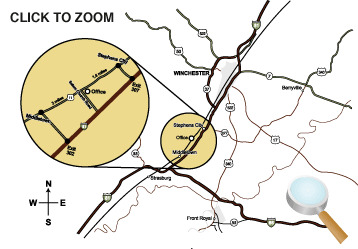 We are located between Middletown and Stephens City, just off Route 11. © Copyright 2009 Mark R. Zemanovich, D.D.S., P.C.